In the processing of chocolate and confectionery, special rotary positive displacement pumps are used to move the chocolate through each of the process steps, from milling cocoa beans to depositing, enrobing or panning. Since the first pumps were used to move chocolate, people have struggled with how to keep it from leaking out along a pump’s shaft where it exits the casing. Viking Pump recently announced their new leak free chocolate & confectionery pumps. We publish it here for the convenience of Kerr customers. 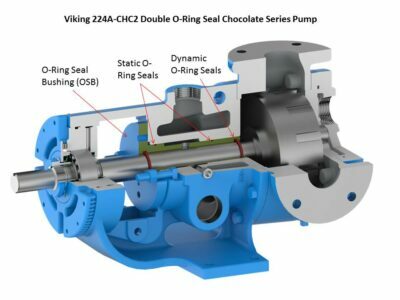 While expensive, high tech solutions have been tried, such as cartridge-type double mechanical seals with external quench systems, Viking Pump has developed a new low-tech, low-cost means of sealing chocolate in. Viking’s Chocolate Series pumps use proven double O-ring seals with food grade grease barrier to keep chocolate in the pump, and keep it out of the bracket where it could cause a pump to seize up or leak. What’s so difficult about chocolate? It’s viscous, abrasive, and solid at ambient temperatures. It burns or caramelizes when overheated. It separates when sheared, with cocoa butter weeping out, leaving only solids that can lock up a pump. Let’s look at some common sealing solutions and compare them to the O-Ring Seal. The simplest and most commonly used means of sealing chocolate in the pump is to use braided packing in the stuffing box, as shown in the 224A Packed Gland Pump picture. This design goes back to the earliest pumps, where users stuffed rags around the shaft. But packing must be loose enough to allow some chocolate to weep out, usually a drop per minute is recommended, to cool and lubricate the packing. This leakage results in housekeeping and hygiene issues, along with product loss. While generally reliable, it is not uncommon for operators to overtighten the packing glands to minimize leakage, which results in burned chocolate, scored shafts and pumps locking up. Mechanical seals, shown in the Viking 4124B Pinned Seat Mechanical Seal Pump picture, are another means of keeping the chocolate in. 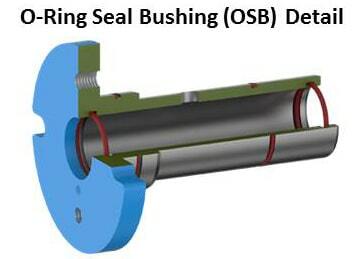 The preferred seal location is immediately behind the pump rotor, with a lip seal at the stuffing box. This allows the bracket bushing that supports the pump shaft to be lubricated by clean, food grade grease instead of abrasive chocolate. These seals work well unless the pump is over-pressured, or started up when chocolate is not completely melted, which can damage the seal. 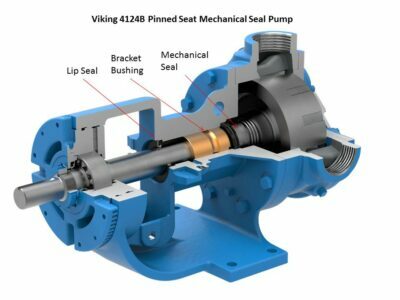 Viking’s Double O-Ring Seal design, seen in the Chocolate series pump picture utilizes a patent-pending back-pull-out bracket bushing with two sets of O-rings to seal food grade grease in the bushing area. This prevents migration of chocolate along the shaft, and keeps it in the pump. The bracket bushing is lubricated by clean grease instead of chocolate for long life, and requires no special clearances. O-Ring Seals are tolerant of abuse, and require no periodic re-tensioning like packing does. They exhibit strong abrasion resistance on chocolate liquors, and can handle any viscosity from that of thin cocoa butter to very thick chocolate paste or peanut butter. Unlike lip seals, which are designed for low pressures only, O-Ring Seals can tolerate very high pressures, and in fact are used as dynamic seals on hydraulic cylinders. And when they need replacement, the cost of four O-rings is negligible compared to the cost of mechanical seals. 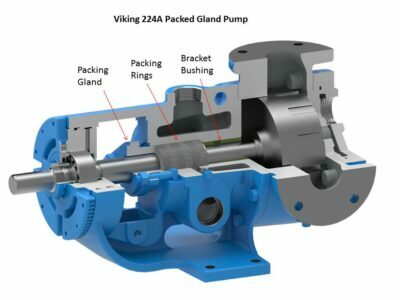 Viking’s Chocolate Series pumps offer a number of other standard features to ensure reliability, including: jacketing on the head and bracket to melt chocolate before startup; flush and suckback grooves that prevent chocolate buildup behind the rotor; drilled idler gear with hardened iron bushings to prevent caramelization; hardened steel shafts; and steel or ductile iron rotors for high viscosity. All materials are food grade, and the pumps are all stamped EC-1935 compliant to prevent leaching of harmful materials into food. For chocolatiers with existing packed Viking chocolate pumps, these may be easily converted to the double O-Ring Seal design. Convenient kits provide all of the components necessary for conversion, and a video is available on the Viking Pump website to show how it’s done.